Following Sunday’s Yerevan City Council elections, Prime Minister Nikol Pashinyan emphasized the imperative to hold snap parliamentary elections, announcing that he will begin negotiations with parliamentary and non-parliamentary political forces to discuss the timing and feasibility of holding the vote. Pashinyan made the announcement at a gathering of Armenian-American community representatives at the Yale Clun in New York, where he is visiting to attend and speak at the United Nations General Assembly. Pashinyan explained that initial plans were to hold the snap parliamentary elections in June, 2019, however, to improve Armenia’s economic environment and strengthen investor confidence in Armenia, it was imperative that the legislative elections are held in the earliest possible timeframe. “Today our most important objective is to attract new investments. With this purpose we have initiated reforms in the tax code, establishment of an independent judiciary, maintaining a stable political situation, for which we must hold early elections of parliament. With the results of the Yerevan City Council elections, it is clear for everyone that early elections of parliament are inevitable, and that the elections should take place as soon as possible,” stress Pashinyan. 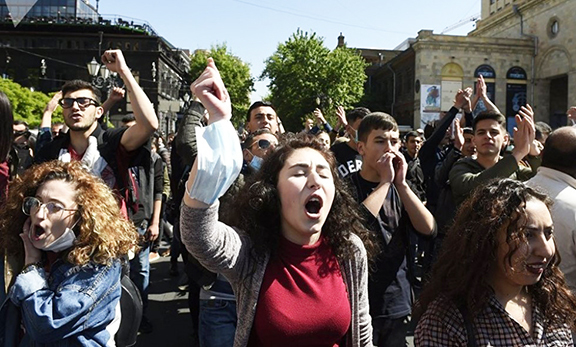 By his assessment, Sunday’s Yerevan municipal elections were held without corruption, vote-buying as and interference “from criminal elements” as was the norm in prior elections in Armenia. “Today, money does not play a role in the outcome of elections,” said Pashinyan who explained that mechanisms must be put in place that funds spent during an election cycle are not to used to buy votes, but rather to advance a candidate’s or a party’s campaign. “To improve Armenia’s economic environment and strengthen investor confidence in Armenia, it was imperative that the legislative elections are held in the earliest possible timeframe”. Must be understood: “To consolidate and strengthen the power of the Prime Minister, it is imperative that the legislative elections are held in the earliest possible timeframe”. With the victory of Yerevan votes, this man thinks he can win more members of his party in the parliament. It is degrading to see Armenians in Armenia being deceived by this man. We should all SUPPORT Pashinyan and Armenia in any possible way we can. Dear Mr. Prime Minister. actions talk louder than words. If you want investment and development in Armenia’s economy. FIRST GET RID OF THE OLIGARCHS!